“Champ” the Lake Champlain monster is back bothering residents of Burlington, Vermont. 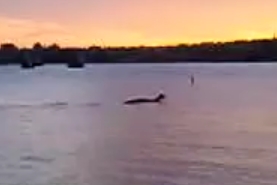 The above image is a screen shot from the latest Lake Champlain monster video of a mysterious dinosaur like creature crossing the water. Alas we could not post it here because they took away the embed code, but Cryptomundo has a great write up on analyzing this latest video, as well as studying the history of the Lake Champlain Monster.